High-strength, low-power aluminum LED pole mount displays are perfect for lining the streets of cities, shopping and lifestyle centers. Lit with commercial grade lights, these displays are not only easy to install, but they use a fraction of the electricity required by incandescent displays. LED rope light in pure white. 8.0'H X 4.0'W, approx. 24 lbs. 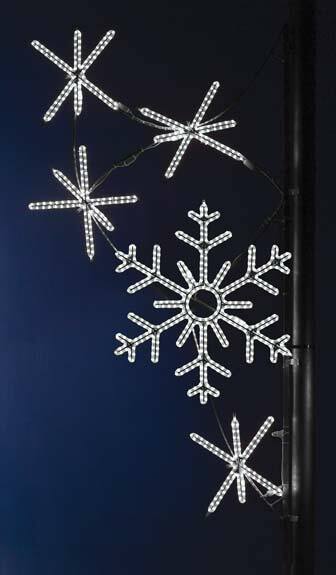 Delightful pure white LED snowflake cascade will transform your township to a winter wonderland! Stunning contrast of blue light and pure white LED snowflakes are a fantastic way to bring holiday cheer to your display.